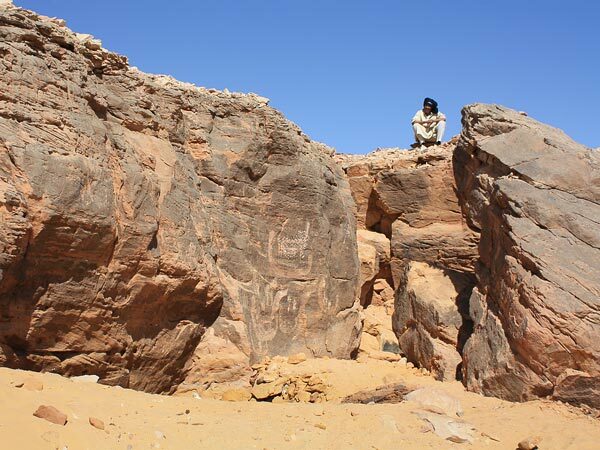 This ancient rock picture near Egypt's Nile River was first spotted by an explorer more than a century ago—and then almost completely forgotten. Scientists who rediscovered it now think it's the earliest known depiction of a pharaoh. The royal figure at the center of the panel wears the "White Crown," the bowling pin-shaped headpiece that symbolized kingship of southern Egypt, and carries a long scepter. Two attendants bearing standards march ahead of him; behind him, an attendant waves a large fan to cool the royal head. A hound-like dog with pointed ears walks at the ruler's feet. Surrounding the king are large ships, symbols of dominance, towed by bearded men pulling on ropes. 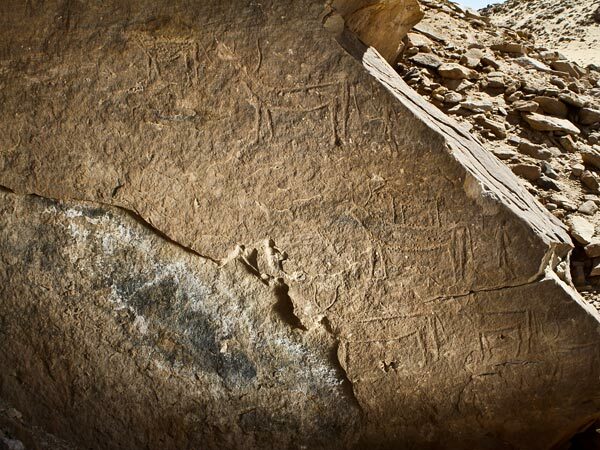 The picture, which was engraved on a sheer cliff face in the desert northwest of the city of Aswan, was probably created between roughly 3200 and 3100 B.C., according to researchers who published their discovery in December's issue of the journal Antiquity. At around the same time that the picture was crafted, northern and southern Egypt were united under the reign of a supreme monarch, or pharaoh. The pharaoh in the picture may be Narmer, the king who overcame the last vestiges of northern resistance to southern rule and is considered by many to be Egypt's founding pharaoh. This rock art picture, known as tableau 7a, is nearly ten feet (three meters) wide. 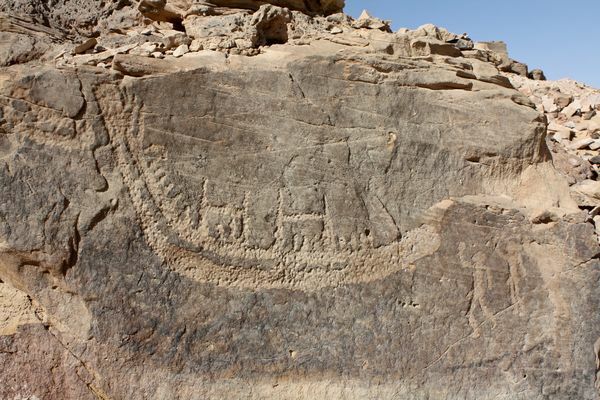 That makes it the largest of the pictures at the site, called Nag el-Hamdulab after the neighboring village. Earlier Egyptian art tends to show not kings themselves, but emblems of royal or divine power, said Yale University's John Darnell, one of the paper's authors. An image of a bull or falcon, for example, was often used as a stand-in for the king. When human rulers were shown, they were small and peripheral, as if they didn't count for much. But here, for the first time, the king is dominant. "It's an amazing depiction, artistically and textually, of the birth of dynastic Egypt," Darnell said. The change in the king's depiction reflects changes in the nature of kingship at the time, said Yale University archaeologist Maria Gatto, another author of the paper. "He's not just a regular man like everyone else," she said. "He's a god, someone special who can help you be in contact with the supernatural." An imposing flotilla testifies to the power and status of the pharaoh. This close-up of tableau 7a shows five vessels accompanying the king. Four of the boats have the crescent shape or the animal emblems that mark them as royal vessels. The fifth boat bears a shrine showing that it's a sacred vessel. Boats became an important symbol of power even before the unification of Egypt, Gatto says. Kings were thought to ride to the underworld in boats, and the sun god was believed to sail across the sky in a boat. The line of royal boats and an accompanying inscription suggest that this was a "Following of Horus," a tour the pharaoh made of his kingdom every two years. The pharaoh and his court collected taxes while traveling in elaborate nautical processions—an early form of "political propaganda," said Gatto. "Imagine this huge procession of boats with magnificent decorations," she said. "It would've been very impressive for people living in small communities scattered along the Nile." Though difficult to make out, this picture shows a herd of long-horned cattle accompanied by two human figures and two dogs. 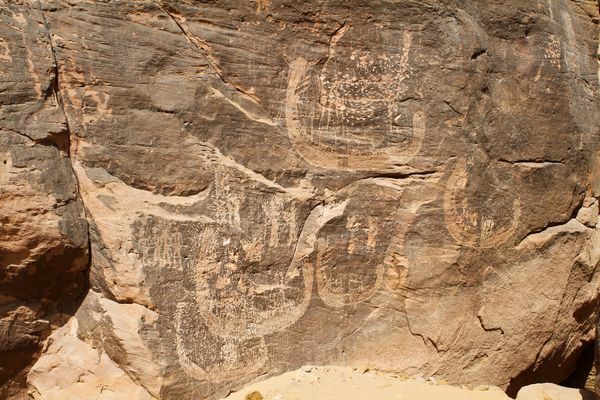 It could be a hunting scene, which was a common genre before the time of the pharaohs. Hunting was a pasttime of the elite, who could demonstrate their control over nature and their ability to establish order by killing wild bulls. The scene could also be a more peaceful depiction of herders and their cattle, which might have been claimed by the king as a form of tax. Nag el-Hamdulab borders what was once the neighboring state of Nubia, whose people were nomadic herders and, in a later period, soldiers in the Egyptian army. Three men on foot seem to be shaking their upraised fists at the boat in front of them. Based on other images from roughly the same time period, the researchers think the men aren't aggressors but prisoners: The features that look like arms thrust into the air are probably ropes tied to the men, whose arms are bound behind their backs. A second tableau nearby shows a prisoner who seems to be tied to a boat. Recognition of the uniqueness of these artworks has been a long time coming. The site was discovered in the 1890s by a British scholar who published a sketch of some of the pictures, but didn't recognize their significance. Another scholar photographed the Nag el-Hamdulab tableaux in the 1960s, but never published his findings. Finally a Norwegian scientist and his team reported in 2009 that they'd rediscovered two of the artworks. Gatto found the others shortly afterward.